Bioassay can perform high quality assays for Antibody Dependent Cell mediated Cytotoxicity (ADCC) Complement Dependent Cytotoxicity (CDC) as part of its BioPharma Potency portfolio. Reliable and high quality ADCC & CDC assays have assumed greater significance with the growing importance in medicine of Therapeutic Antibodies (tAbs) and their role in combating cancers. Antibody Dependent Cell mediated Cytotoxicity is a prime mechanism of immune defense, along with Complement Dependent Cytotoxicity (CDC), attributed to the mode of action of several tAbs, in particular tumor cell targeting. Bioassay’s ADCC assay is based on natural killer (NK) cells, delivering a readout for target cell lysis for a range of target cell lines, using purified NK effector cells. These include genotyped 158 V/F and 131 H/R NK cells, with quality controlled using flow cytometry based on CD16 and D56 marker expression. Bioassay has established protocols for several tAb FACS-based ADCC Assays, with different stainings of target cells, such as PKH26, Calcein AM), tAb FcR, generic tumor cell and killer cell. 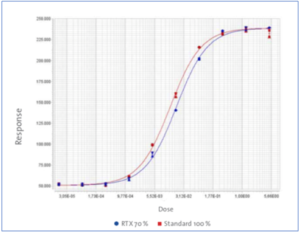 For comparative ADCC potency testing, Bioassay uses a double controlled assay by measurement of fluorescence in supernatant (NK cell lysed) and direct lysis of remaining target cells (detergent lysed). The assay produces a full logistic curve fitting with data readout driven by target cell lysis endpoint. Bioassay can also offer cGMP CDC assays that use normal human serum as the source of complement. Complement-dependent cytotoxicity is the mechanism by which antibodies lyse unwanted targets by triggering a series complement-related reactions. Similar to ADCC, antibodies elicit ‘killing’ effects by binding Fc to serum complement components, particularly C1q, eventually forming a membrane attacking complex (MAC) that targets cell destruction. Typically CDC manifests as a vital mode of action in most therapeutic antibodies; enhancing the effect of ADCC. This is a complex process involving a wide spectrum of cellular elements, which means an effective CDC assay needs to consider many parameters in detecting, analysing and quantifying CDC activity in investigated antibodies. Bioassay’s integrated CDC assay portfolio offers a high-quality complement system in human serum, complying with GLP and GMP guidelines. Sera from rodent species can be used as alternatives. Multiple endpoints and readout formats are available, with typical endpoint by target cell lysis (e.g. LDH/ATP/GAPDH release or FACS screening). We can also design alternative assay readouts upon custom request. A pre-proven CDC assay format features CD20 and TNFα and primary targets. All Bioassay biopharma potency assays are conducted in conformity with GLP & GMP standards, forming the basis for core quality and reliability standards. This compliance guarantees acceptability of data generated for product acceptance and licensing. Click on Bioassay ADCC/CDC Assays for more information. 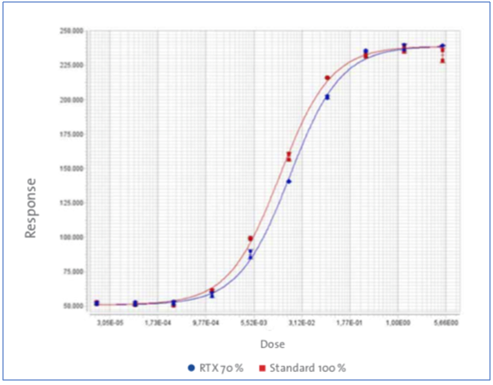 Example for MTP ADCC Assay: MabThera® (RTX) was used with 100% and 70% potency levels in comparative potency testing with Calcein AM fluorescence (vertical) and RTX dose (horizontal) shown as response parameters. A 4-PL fit was used for potency determination, in this case showing estimated potency of 69.3% versus stated 70%, with relative confidence interval of 12.5%.